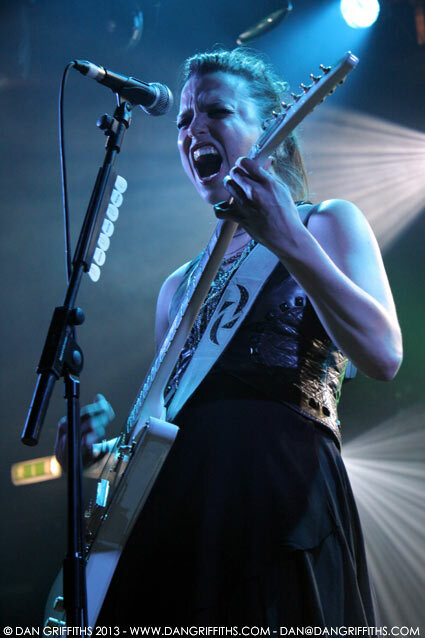 Here are some images of Halestorm kicking off their tour in Camden’s Electric Ballroom last night. The quartets London shows was great and front woman Lzzy Hale has a pretty flawless vocal. Halestorm are from Red Lion, Pennsylvania. The group’s self-titled debut album was released in 2009 and their second album ‘The Strange Case Of…’ was released last year. The song ‘Love Bites (So Do I)’ from that album won a Grammy Award for Best Hard Rock/Metal Performance in February. The band consists of Lzzy Hale, Arejay Hale, Joe Hottinger and Josh Smith.